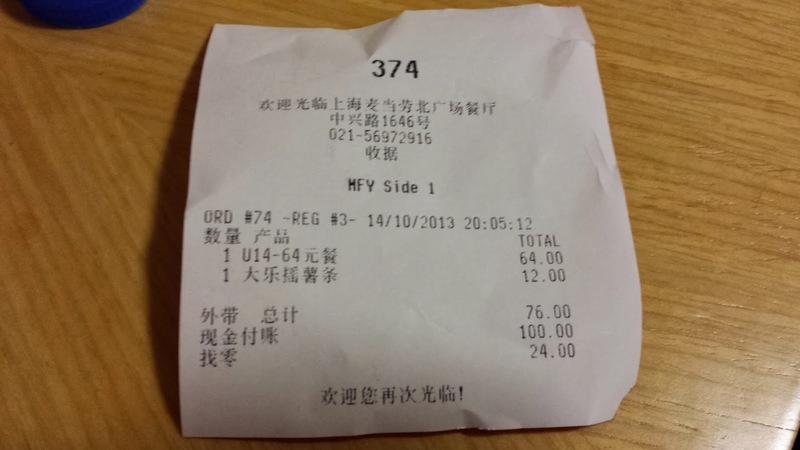 The Beef Rice Wrap was another item I had in the 64CNY dinner combo last month in Shanghai. So far, I've only (kind of) reviewed the Mushroom Soup from that set, and I still have a couple more to do. Hopefully I'll get them written up over the next couple of days. My friend from Canada has been staying with us for the last week, so I haven't really had time to sit down and write reviews. I still have a backlog of items, so make sure to check back soon. 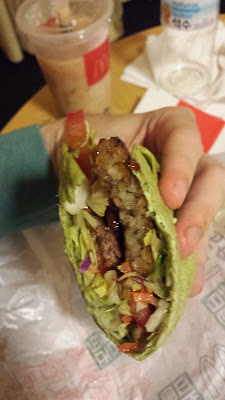 I was excited to try this wrap, as it combined two item's I've enjoyed before, the Spinach Snack Wrap which I had in China a couple years ago, and the recent Rice Fun Wrap, I had in Hong Kong (and was also available in Taiwan earlier this year). At first I worried that McDonald's were going to take two items that I previously enjoyed, and combine them into one lacklustre new item, but fortunately that wasn't the case, and I was pleasantly surprised with the result. Not only was the freshness of the rice from the Hong Kong rice wrap still there, but the soft Spinach flavoured tortilla that I enjoyed in early 2012 was the same. Since it was a full size wrap, they used hamburger patty, a large rice patty and a decent amount of vegetables. Rather than the rice being seasoned separately, (like they did in Hong Kong) this was plain white rice mixed together with the sauce. 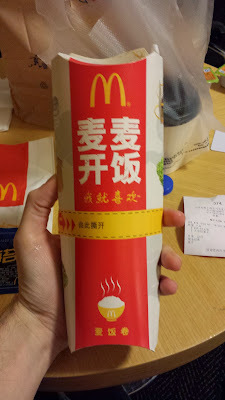 It wasn't the same Teriyaki sauce they used in Hong Kong, it was a almost BBQ-sauce flavoured dark sauce, it was as sticky, as it was salty and sweet. 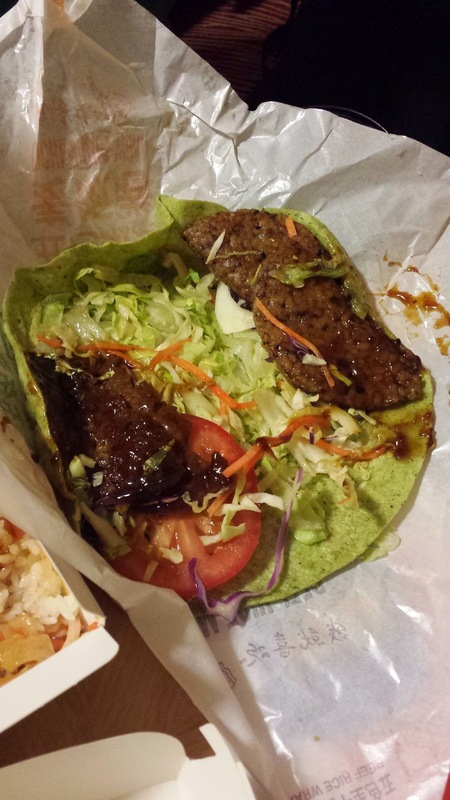 The sauce on its own wasn't great, but it still worked well it just tasted rather low quality. I'm glad they didn't add mayo like they did in Hong Kong, but I'm sure that was because there was already enough sauce in the rice. 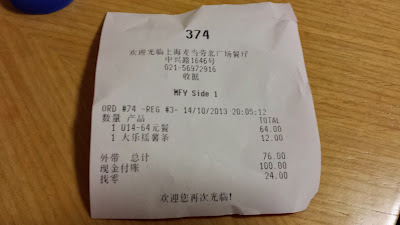 All in, I enjoyed it, and it's something I would order again if I had the chance. 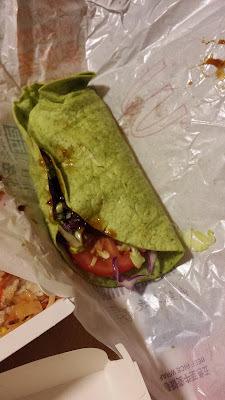 It was a decent size, albeit a bit smaller than the Wrap I had in Malaysia, and though this Chinese wrap used nicer quality vegetables than in HK, it couldn't match the quality of the Malaysian one.